Steelers 2019 Quarterback Draft Needs: Should Pittsburgh Stand Pat? Quarterback is the most important position in the NFL. In Ben Roethlisberger the Steelers have their franchise quarterback. Yet, they looked to quarterback when the picked Joshua Dobbs in the 2017 NFL Draft and Mason Rudolph in the 2018 NFL Draft. Could or should the Steelers look to draft another quarterback in the 2019 NFL Draft? Let’s take a look…. 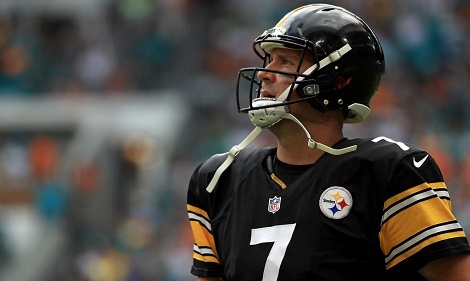 Ben Roethlisberger will be 37 on opening day 2019 and has been the Steelers signal caller since the 2nd game of the 2004 season. While it took him a long time to get the respect he deserves, Ben Roethlisberger is finally seen as one of the NFL’s best. However, Father Time is undefeated in his races with even gifted athletes. The question of a player losing a step to the Old Man is one of “when” and not “if.” Is Ben Roethlisberger losing a step? The record is mixed. Ben Roethlisberger had an awful start to the 2017 and while the lull wasn’t as pronounced in 2018, he still started slow. It is also tempting to look at his 16 interceptions and claim that as evidence the Big Ben is nearing his 11th hour. But such claims are exaggerated. Yes, Ben Roethlisberger’s slow starts are a concern, but his 2018 interception percentage was actually lower than the year before and below his career average. He also threw 458 passes, far more than he’d ever thrown before. He took a few more sacks but he’s not absorbing anywhere near the punishment he was absorbing earlier in his career. More importantly, he seems to be playing with much more harmony under Randy Fichtner than he did under Todd Haley. The Steelers Red Zone percentage in 2018 soared to 73% well above the middling 53% mark they attained in 2017. Could Ben Roethlisberger be one of those players who “gets old fast” the way say, Hines Ward did? It is a possibility, but also one that is impossible to anticipate, and the Steelers shouldn’t “Live in their fears” as far as that is concerned in the 2019 NFL Draft. 2018 marked a radical change in the Steelers bullpen philosophy. Dating back to the 1989 season when Chuck Noll had Todd Blackledge and Rick Strom backing up Bubby Brister, the Steelers practice has been to staff an experienced veteran behind their starter, followed by a young player who offer some sort of “upside” if not more. The practice continued under Bill Cowher and Mike Tomlin. That changed the moment the Steelers cut Landry Jones and decided go with Joshua Dobbs and Mason Rudolph behind Ben Roethlisberger. For the first time in over a generation, the Steelers had two men backing up their starting NFL quarterback who had never thrown and NFL pass. Joshua Dobbs won the backup job with a stellar preseason underpinned by an unwavering work ethic. He was called into action twice in the 2018 season, first against the Ravens where Dobbs audibled out of a running play and completed a critical 3rd and long while planting in the Steelers end zone. The poise and decisiveness of Dobbs’ execution was breathtaking. The second time came in the 2nd half at Oakland. The truth is that Joshua Dobbs was far more tentative that day and looked out of rhythm with his receivers. Mason Rudolph is an unknown at this point. If reports are to be believed, at least one of the key members of the Steelers brain trust had a 1st round grade on him going into the 2018 NFL Draft. The Steelers drafted him with their extra third round pick, giving up a 7th rounder to move ahead of the Bengals who were said to be targeting Rudolph. By all accounts Mason Rudolph looked solid in preseason, but he wasn’t strong enough to beat out Dobbs. That shouldn’t be to big of a knock of Mason Rudolph. Suffice to say, many NFL teams would love to have had a 3rd string quarterback of his pedigree. The idea of the Steelers drafting a quarterback in the 2019 NFL Draft is almost an academic question. Clearly, with Joshua Dobbs and Mason Rudolph the Steelers don’t need to add quarterback depth in the draft. What about finding Ben Roethlisberger’s replacement in the 2019 NFL Draft? 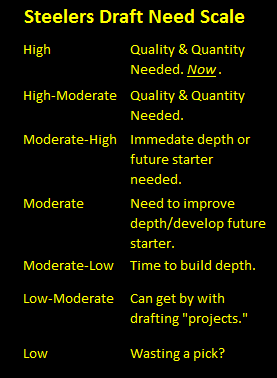 All pre-draft projections indicate that the franchise-capable quarterbacks will be long gone by the time the Steelers pick at 20th. Even if they’re not, the possibility of a strike or lockout in 2021 is very, very real. Of course, if the Steelers found themselves in the same situation the Packers were in in the 2005 NFL Draft when Aaron Rodgers dropped in their laps the should consider pulling the trigger, but the chances of that happening are remote. The Steelers quarterback needs in at quarterback in the 2019 NFL Draft must be considered Low. This entry was posted in Steelers 2019 off season, Steelers Draft and tagged 2005 NFL Draft, 2017 NFL Draft, 2018 NFL Draft, 2019 NFL Draft, Ben Roethlisberger, Bill Cowher, Bubby Brister, Chuck Noll, Hines Ward, Joshua Dobbs, Landry Jones, Mason Rudolph, Mike Tomlin, Randy Fichtner, Steelers quarterbacks, Todd Haley. Bookmark the permalink.